After watching the Buffalo Sabres score only one goal in road losses to New Jersey and Ottawa, General Manager Jason Botterill recalled Rochester's leading scorer, winger Victor Olofsson, on Wednesday. Olofsson, 23, has a team-high 60 points, including 27 goals, in 64 games during his first season with the Amerks. He will likely be in the Sabres' lineup when they host the Detroit Red Wings in KeyBank Center on Thursday night. The Sabres have been hit with a rash of injuries and illness over the past four days, forcing them to recall defensemen Lawrence Pilut and Will Borgen from Rochester. It remains unclear what led to Olofsson's promotion. Evan Rodrigues left after being hit in the second period during Tuesday's 4-0 loss in Ottawa but returned to take six shifts in the third period. Tage Thompson also left early for the dressing room in the second period, only to finish the game with six shifts over the final 20 minutes. Sabres defensemen Zach Bogosian (lower body) and Matt Hunwick (upper body) were unavailable during the two-game road trip because of injury, while an illness prevented Rasmus Ristolainen from playing Tuesday night. There is also the possibility that Botterill wants to see if Olofsson can help the struggling Sabres. They are amid a 13-game winless streak away from KeyBank Center, have not won back-to-back games since Dec. 13 and were shut out in four of their previous nine games. The Sabres' only goal during the road trip was Sam Reinhart's dump-in from center ice Monday in New Jersey. Though they had 46 shots on goal in a 3-1 loss to the Devils, the offense barely threatened Ottawa goalie Craig Anderson on Tuesday night. A previous recall, winger Alex Nylander, has contributed since being promoted on the even of Jack Eichel's two-game suspension this month. Nylander, 21, has two goals and two assists with a plus-2 rating in eight games but was called for a pair of minor penalties in the shutout loss to the Senators. Olofsson has blossomed since beginning his career in North America. A seventh-round draft pick in 2014, his stock rose significantly last season, when he scored 27 goals as a teammate of Rasmus Dahlin with Frolunda HC of the Swedish Hockey League. Olofsson's left-handed shot has terrorized opposing goalies since he joined the Amerks. He is tied for the AHL lead with nine-game winning goals and ranks in the top 10 in points and goals. 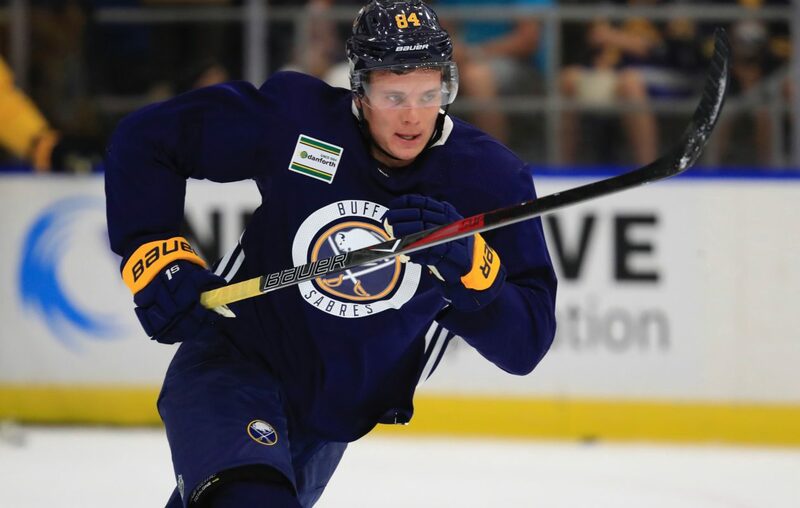 Olofsson signed his two-year, entry-level contract with the Sabres last April after finishing with 60 goals in 200 career games in the SHL. The timing is unfortunate for the Amerks, who are three points behind Syracuse for first place in the AHL's North Division with nine regular-season games to play. Rochester hosted Lehigh Valley on Wednesday night and has two games this weekend.